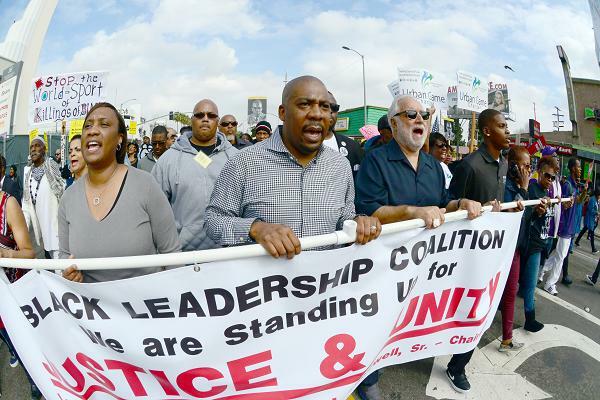 March For Justice – March and Rally held in the Crenshaw Distrcit of Los Angeles, California, USA. February 21, 2015. March started at LAPD Headquarters on Martin Luther King, Jr. Blvd and proceeded to Leimert Park. In attendance were Danny Blakewell, Rev. Exavier Thompson, Congress Woman Karen Bass, and members of the Ezell Ford family. Ford was shot to death by LAPD officiers in August of 1984. This march was a protest of police violence and brutality and coincided with similar marches across the country as well as the 50th Anniversay of the slaying of Malcom X.